I had the pleasure of enjoying a casual talk with The Omni Group CEO Ken Case and took the opportunity to ask him some questions on their upcoming release, OmniPlan for iPad. We also had some time to talk about potential updates to other Omni products, as well as projects Ken would like to work on, given more time and resources. Don: First off, what where some of the challenges you had porting the OmniPlan for Mac experience to the iPad? Ken: One of the challenges we have had with all of our apps is that the Mac has more screen real-estate available, or at least the design we have used for our apps use a lot more screen real-estate than we have available on the iPad. We had already started noticing that some of our apps were starting to feel a bit squished on laptops -- we have typically designed them to work with large desktop displays. When we watched people try to struggle through using some of our apps on the nice new MacBook Airs like the ones we’re starting to use here we found it just felt too cramped. So starting with OmniGraffle we had to re-picture what is the focus of the activity and how can we get rid of the physical controls without burying them so deep that they are no longer accessible. 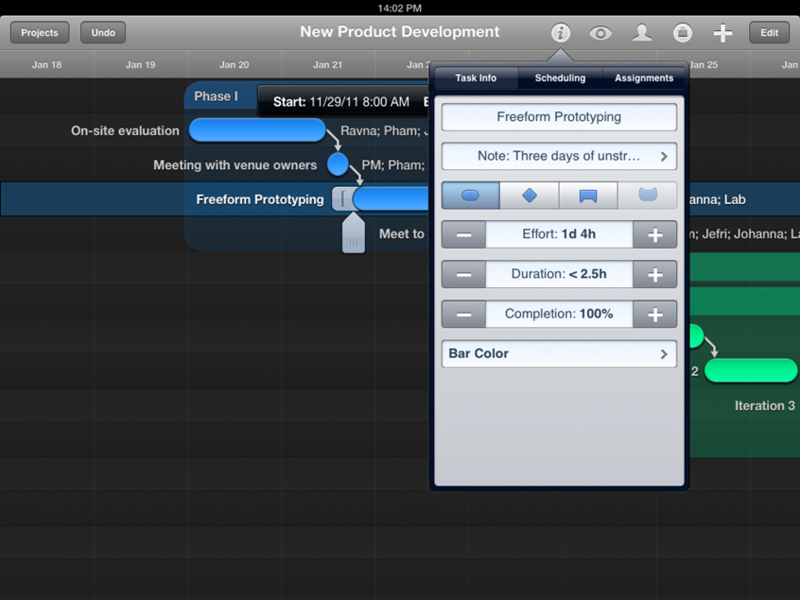 We faced this challenge even more so in OmniPlan for iPad because OmniPlan typically uses more screen real-estate due to its task outline on the left and the large visual GANTT chart timeline on the right. 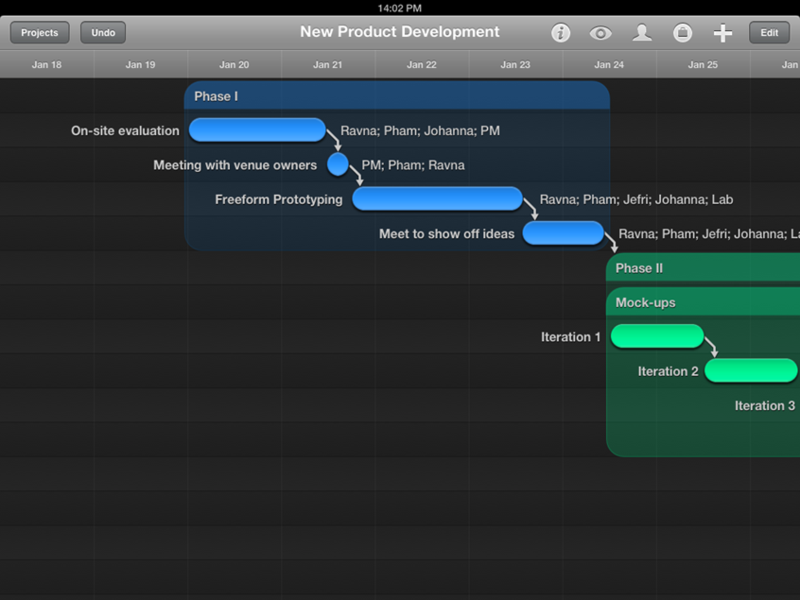 So we decided that the most relevant part of using OmniPlan is not the outline which may be of interest for structuring your plan data, but what people are most interested in is the GANTT chart timeline; so, for Omniplan for the iPad we just focused on that being the entire contents of the screen and working with that and trying to create the content in the visual timeline in ways we would normally rely on the outline for doing. If you wanted to have a task and break it down into subtasks, on the Mac we’d have you go over to the outline and create new rows and indent them underneaths as they were subtasks. If we’re only using the GANTT chart, we want to be adding subtasks – be able to show containment of subtasks under the parent task right there in that live timeline. I’m not saying we’re going to be giving up the outline, we’re not done yet, that’s the struggle we’re trying to work with and maybe the real ultimate answer is to flip back and forth between the two but there’s definitely not room to have both at the same time. Screen real-estate is a real challenge. Don: Now when you guys released OmniFocus for the iPad, there were some things that a lot people thought the iPad did better than the Mac version. Is there anything in OmniPlan you guys feel is better suited for the iPad? Don: I read on your blog around the release of OmniOutliner for iPad that you wanted to offer 90% of the functionality that people wanted with about 10% of the effort. Do you think that also applies to OmniPlan, were you able to fit as much in without sacrificing the usability? Ken: I think we were able to get a lot of the info in we wanted – it was a little bit harder, this was a specific challenge to OmniPlan – with OmniGraffle or OmniFocus it was easier to find parts of the application you could live without on the iPad on Day 1 or maybe forever, and just leave that out altogether and maybe bring back in later or maybe not, but you have a useable, cohesive, coherent application you can sit down and work with. With OmniPlan, you’re talking about an audience of project managers who really need to have all the same project details they’re used to typically. If we left out some piece, like, say, cost accounting, then people who are trying to do cost accounting will be stuck, and they can’t do it at all anymore. They can’t partially use it and then go up to their desktop later. If you have that then you probably want to bring all those details to a meeting that you are bringing your mobile device to. That was another challenge with OmniPlan – it was harder to find things we could cut out. We couldn’t cut out any of the data model, which we had done with all the other apps. With OmniFocus we left out time estimates altogether on the iPad -- most people didn’t use it and it was more cluttered to try and fit in there. With OmniPlan we have all those fields, all those details, and the change tracking, mechanisms and so on. We did find some areas we could cut out and leave out, like printing. Our hope is, part of the reason you’re bringing this around with you on a mobile device is so you don’t have to bring paper around with you. Showing people the plan right there, live and making changes – you couldn’t do that with a printed document. Don: So it sounds like it could be a great addition to the current OmniPlan for Mac product. Ken: Yes, we really wanted it to be as complete as the Mac version and try to leave as little out as possible, but we did have to in some situations. For example, in version 1.0 we are not providing printing because we are not trying to make it do everything the Mac version can do. 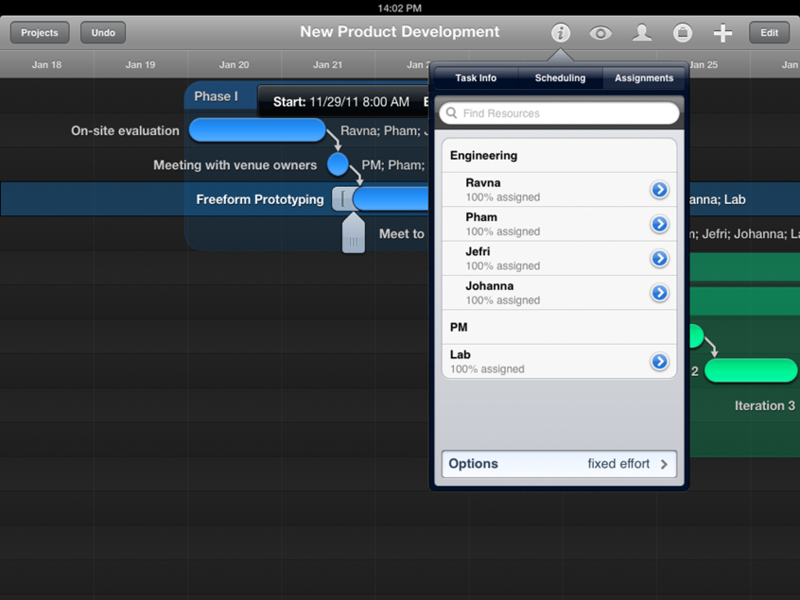 We do want it to be a standalone tool so if all you’re using is OmniPlan on the iPad, you’re still able to do the complete project management and planning you would’ve done on the Mac including collaborative editing. Plus, change-tracking is there, so you can review other people’s changes, accept and reject them and so on. 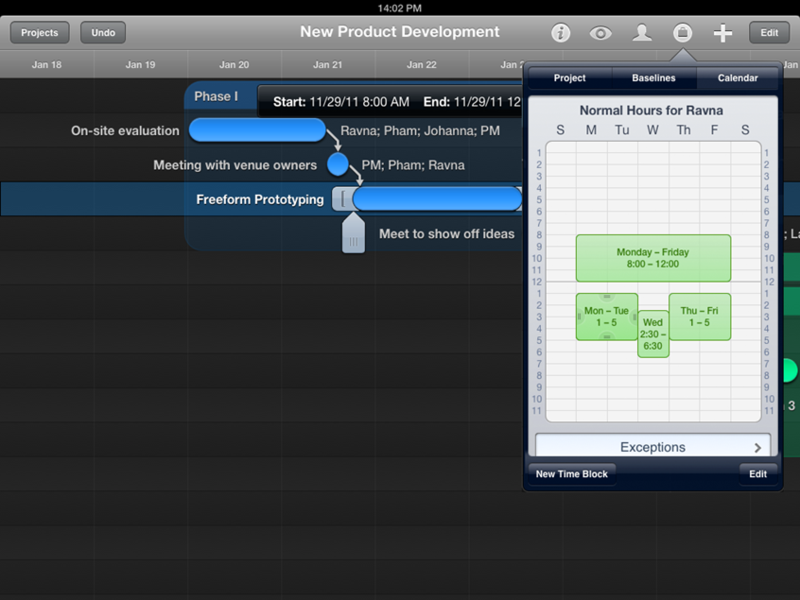 Don: Is there anything you can tell me about the tentative release or pricing for OmniPlan iPad app? Ken: We haven’t announced pricing yet because we like to finish what we’re building, and then decide how much it costs, but if you look at our pricing to date it has been remarkably consistent. The iPad app – every single one – is half the price of the corresponding Mac app. Don: Any comments on what’s next for The Omni Group after OmniPlan? Ken: The biggest thing is document syncing. Before OmniPlan ships, we have a new document browser interface becoming available on our iPad document-based apps -- OmniGraffle, OmniOutliner, and OmniGraphSketcher -- and that was our way to set the stage to be able to sync documents in those apps. The older interface where you’re swiping through and looking at one document at the time, it gets pretty tedious if you have many documents. When your’e syncing your documents around, you want all your documents available at all times in the interface. That’s our next round of releases and that’s in the next month or so. After that, next quarter we plan to release OmniPlan; as for document syncing – we don’t know how long the iCloud work will take. Our work on that is actually done, so at this point we’re waiting for other updates from Apple. In the meantime, we’re working on adding document syncing through our own OmniSync servers so we’re not just waiting indefinitely. Don: Great. So with iCloud now available, how can we expect to see that utilized in up-coming OmniGroup updates or future apps coming out? Ken: Our plan is to get iCloud into OmniGraffle, OmniOutliner, OmniGraphSketcher as soon as possible. Those are the 3 that don’t have any built-in syncing of their own. OmniFocus and OmniPlan have their own syncing that is richer than iCloud allows. iCloud allows you to sync an entire document around so you’ll get the entire state of the document as it is on one machine copied over to another machine. With OmniFocus and OmniPlan we’ve designed it so if I make a change on two devices, I’ll synchronize those changes on the two devices together so I can see the same thing on both ends and I don’t lose those changes. If you do that sort of thing with iCloud, like using OmniGraffle with iCloud and make edits with both machines, then you’ll end up with a conflict and have to choose one or the other or save both (changes don’t merge together). That’s why in our initial plan -- since we already have syncing in OmniFocus and OmniPlan -- we’re not planning to add iCloud for them since it’s a worse syncing system than we have available, but we are planning to add iCloud syncing to the other 3 as soon as possible. Don: Are there any plans to update OmniFocus for Mac this year? Ken: Absolutely. There’s an update planned for this quarter for OmniFocus - not OmniFocus 2 to be clear, but we think a lot of customers will be really happy in what’s coming up in this release. Don: You mentioned on your blog about possibly doing a bit of a visual upgrade to OmniFocus and pull over some of the features of the iPad app. Ken: That’s not this quarter’s release either, but it’s work that’s in progress. This quarter’s release we thought we’d hop on a feature that is requested a lot and doesn’t require big changes to the user interface, rather than having people wait indefinitely for a feature they’ve been wanting a lot. Don: Can you give me any more details? Ken: I will say it is one of our top 3 requests on all 3 platforms. Since the interview, the OmniGroup released a “sneaky peak” edition of OmniFocus with a new feature: repeating of weekdays or only on specific weekdays. Don: Okay, fair enough. I also wanted to ask you about is OmniOutliner 4.0. Is that still a focus at least for the first part of this year? Ken: Not sure if it’ll be the first part of the year or the second half of this year, but it is certainly a big focus. The way we spread our engineering team around, the tasks we work on now, it has proportionally more than any of the other apps working on it. Actually, just since Macworld, I started feeling comfortable enough using it to edit my outlines… so that is a great milestone. It does have the new sidebar -- we’re getting rid of the old drawer and folding it into a sidebar. The sidebar is present right now and you can navigate with it; the reimplementation is still very much in progress and it’s not ready for beta testing even. But the main outline is working and it is a good sign. Don: The outlining architecture was being rebuilt from the ground up, correct? Ken: Yes, we did rebuild it from scratch and the outlining view went into OmniPlan 2 as it’s the first app that we shipped with it, so the outline view actually works now and there’s all the other features...everything else that hasn’t been updated yet to work with the new format. So OmniPlan didn’t use all the things that people using OmniOutliner care about -- things like video attachments, so that’s some of the stuff we’re reimplementing now, like QuickTime or audio attachments. Don: I know The Omni Group has an incredibly loyal following of users that appreciate all the work you folks do so you probably spend most of your time updating your current line of products for them, but are there any projects you want to work on that aren’t necessarily one of your primary productivity apps? Ken: Oh absolutely. One of the apps that has been on hold now for quite a while now, but I use every day, and is in desperate need of a refresh is OmniWeb. I’d like to get to update that and get built on top of the modern Safari and look into its architecture. We had a bunch of ideas that we had to put on hold for a while on how to make browsing more efficient. That was the major focus of OmniWeb 5: how to build a web browser that can save people time, so we came up with ideas like workspaces that you persistently reload and take snapshots of and work with. We’ve been using that for almost 8 years now, and in that time we’ve thought of a lot more that we could be doing with those and thinking about pieces we don’t use in a web browser at all. I don’t know about you, but I don’t use bookmarks other than maybe shortcuts up at the top of the window or as a way to do keyboard completion to quickly get back to something. I don’t ever browse a big list of bookmarks, I might have done that in the 90s. I’d rather have something nice integrated with the browser -- like persistent history that’s also searchable. Don: Right, I see what you are saying, or perhaps a smarter history capable of sorting and filtering. Ken: If you have ways you’d normally like to lay out your window when you’re browsing, like a website that needs a different sized window than others, it might be nice when you tell your keyboard shortcut to go there that it automatically does that conditioning for you or it opens up more than one tab even. You could have a keyboard shortcut that opens a whole workspace, rather than a single webpage. Those kinds of features. But we still have a lot to do on OmniOutliner 4, OmniFocus 2, so I’m not sure when we’ll quite get OmniWeb back in to the loop. Don: Well Ken, I think that about does it. I appreciate you taking time out of your day to speak with me. Ken: Thank you Don, I appreciate your time as well.